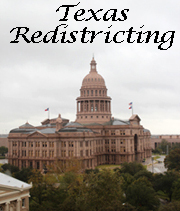 The following is a press release from the Republican Party of Texas - Friday afternoon, the Western District three-judge panel in San Antonio, which is overseeing redistricting and scheduling of the Texas primary, held a hearing in order to determine options as to when the Texas primary should be held, whether we will have one or two primaries, where the district lines will be, and an overall path forward on how to conduct the party's primaries and state conventions. The court heard from attorneys from various plaintiffs groups, as well as lawyers from the Attorney General's office representing the State and the legislatively drawn maps, and also from the attorney for the Republican Party of Texas (RPT), Donna Davidson. The court also heard testimony from various witnesses, including Harris County Clerk Stan Stanart, who was called as a witness by the RPT. During the hearing, the court also allowed RPT Chairman Steve Munisteri to address the panel in order for him to outline numerous concerns of the state party relative to the primaries and state conventions. During the hearing, various positions were advocated relative to when the primary should be held and proposed dates spanned from April 3rd to June 26th. The court also asked numerous questions concerning the need for and feasibility of a bifurcated primary. The Republican Party of Texas' position was that it was still possible to accomplish a single unified primary on April 3rd if maps could be obtained by early February. The Party also took the position, that if for some reason this could not be accomplished - that a single unified primary as late as April 17th would still be feasible if maps were received from the court by mid-February. During his testimony to the court, Chairman Munisteri also explained the difficulty (if not near-impossibility) of moving the state convention, and in his opinion, the impossibility of preparing properly for state conventions (scheduled for June 7-9) if the primary were to be held in late May. The judges ordered that representatives of the two political parties confer during a break to see if there was any common ground that could be agreed upon. Chairman Munisteri entered into discussions directly with the attorney for the Texas Democratic Party, and upon the judges' return, the political parties made an agreed-upon statement that if maps were issued by mid-February, a single unified primary could still be held by mid-April. Also during the hearing, the Attorney General's attorneys reported to the court that they had been involved in significant negotiations with some of the plaintiff's groups who filed the lawsuits against the state. The lawyers for the Attorney General indicated that it was a possibility that agreement on maps could be reached between the state and the plaintiff's groups and that they would work over the weekend and report back to the court on Monday or Tuesday. The Republican Party of Texas has not been invited to participate in these discussions, so we can offer you no details as to the substance of these talks. They will issue an order suspending the deadlines of the December 16th order. They advised the political parties that they can inform party officials and candidates that the February 1st filing deadline will be vacated and that the drawing for ballot positions next week should be postponed. They indicated that if the parties could agree on maps and submit those maps by February 6th, that an April 3rd primary was still obtainable. However, the court and the attorneys have been very specific that any agreement is not a settlement. If there is no agreement and maps are not drawn by February 6th, an April 3rd primary will not take place. In the event there is no settlement agreement and maps are not completed by February 6th, the court makes no present indication of when the new primary would be rescheduled. In the event the parties cannot agree on new maps, the court requires them to submit advisories to the court as to which districts are still in dispute and the issues related thereto. The court will then schedule future hearings if necessary and issue new orders if necessary. Advisory to all Republican county chairmen, precinct chairmen, and party activists - As it is still a possibility that we will have a single unified primary on April 3rd, you can still continue your plans for an April 3rd primary as best as you can until at least February 6th. By February 6th, we should know whether or not we will have an April 3rd primary. Even if maps are not submitted by February 6th, there is still a possibility that a single unified primary could be held in mid-April if the court can draw maps by mid-February. It is unclear what will happen in the event that maps are not drawn by mid-February. We will let you know as soon as we know. We do expect there to be a new schedule issued with new filing deadlines, etc., once it is clear when the primary will be finally scheduled. The final primary date will not be determined until maps are ready to be issued by the court. This is all we know at the present time. Please stay tuned for further updates from the State Party - we will issue them as soon as we have additional information.